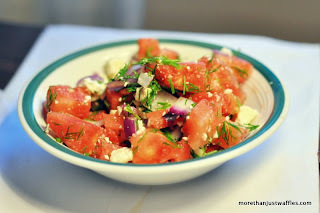 Savory Watermelon Salad: Savory watermelon dishes seem to be all the rage right now. Being a trend-follower I thought I’d try one. Add cubed watermelon, feta, dill and a tablespoon of white balsamic vinegar.